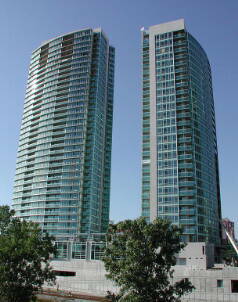 The APEX condominium consist of two towers located at 381 and 397 Front Street West. APEX condo towers are part of Cityplace complex. A mixture of residential, commercial and retail development. 381 Front Street is a 28-storey building featuring 264 units, and 397 Front is a 36-storey building featuring 373 units. At 381 Front Street, units range from 605 to 1,100 square feet, while at 397 Front, units range from 525 to 1,315 square feet. Glass and steel exterior wall building with Floor to ceiling windows. Cityplace condominiums are attractive to young professionals because of its luxury condo amenities and proximity to the entertainment district, financial district and waterfront, CN Tower, and Rogers Center. If you are interested in buying or selling a condo suites at the APEX condo 381 397 Front Street West, please feel free to call me or send an email for detailed information.